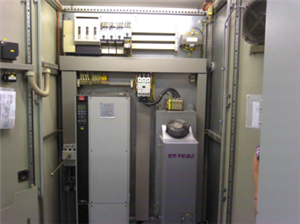 Thermography for the preventive and condition-oriented maintenance of control units enables a fast and complete overview of the system situation. A major advantage of this procedure is that the control unit can be examined during operation. Regular inspections immediately detect every deviation and unusual warming, referred to as hot spots. This means the damage can be remedied according to plan before it results in complete system failure and thus centrifuge downtime. 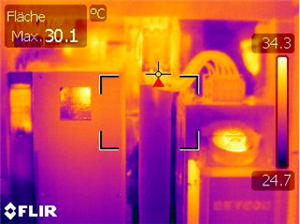 Possible causes of hot spots can be capacity overload or a defect, increased transfer resistance at defective pins and loose clamping connections, or worn contacts of switches and relays. Components approaching the end of their service life can also heat up. Hot spots are viewed as being critical from a temperature of around 80 °C; something then has to be done to prevent potential damage. The HEINKEL Drying and Separation Group creates comprehensive documentation on the thermographic evaluation. This contains the thermal image of the control unit with a temperature scale and the measuring point of the maximum temperature of the hot spot as well as a concluding evaluation of the condition of the device. Take advantage of our expertise and the preventive maintenance ensured by thermography – just give us a call.